Go Away Big Green Monster is a very popular story, especially with younger kids. They love telling the monster to ‘GO AWAY’ bit by bit. 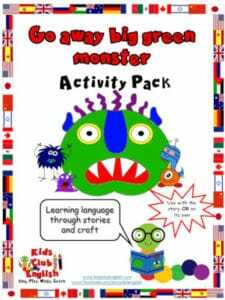 Young children learn to overcome their fears of monsters and at the same time, they learn lots of body vocabulary. 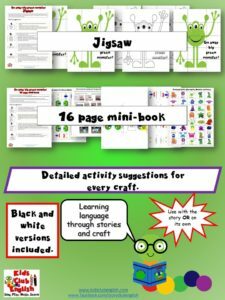 The text in this story is quite repetitive and you’ll be surprised how much kids can remember and join in with. See reviews and purchase options here or watch the videos below. 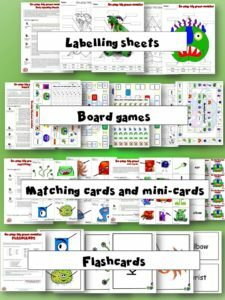 This exciting 222 page activity pack can be used to support children’s learning in a variety of ways. 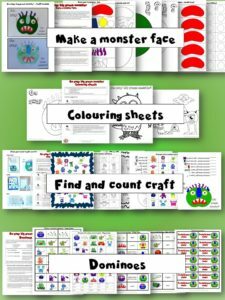 Help children learn about body parts and features, practise colour and shape recognition and build on their counting, literacy and vocabulary skills. These songs are a great complement to Go Away Big Green Monster. There’s a mixture of active and more calming songs to help kids learn this vocabulary.